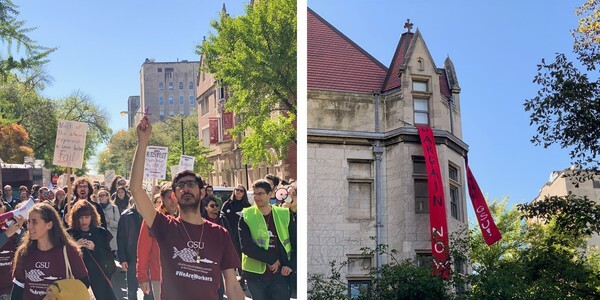 — The walkout began at 11:03 a.m. to symbolize the 1,103 votes cast by graduate students in the union election last fall, before GSU withdrew its union case to prevent a reversal of a national pro-union labor ruling. Clintons on campus: The Clinton Global Initiative University is kicking off today at the University of Chicago. President Bill Clinton and his daughter Chelsea Clinton are scheduled to speak. Mr. Clinton will speak in Ratner Athletics Center. A memorial service for professor Moishe Postone will take place on Monday in Rockefeller Memorial Chapel at 4 p.m., followed by a reception in the Ida Noyes library. The Maroon wrote an obituary for Postone, a celebrated Marxist scholar. First-years elected their College Council representatives in an election that ran from Monday morning to Wednesday afternoon. The Class of 2022 selected Alex Pu, Anya Wang, David Liang, and Zebeeb Nuguse. Columnists Nur Banu Simsek and Salma Elkhaoudi argue that marginalized communities on campus are right to demand more space from the University. “Mo Bamba” launched Sheck Wes to a global audience and his follow-up debut album delivers on the song’s promise. The Hate U Give is a nuanced look at the way in which an incident of police brutality shatters the world of Starr Carter as she balances her Black neighborhood and white prep school. Mass media collective 88rising played a high-energy concert last week with performances from individual members as well as a group finale. Included on Obama’s 2018 summer reading list, Warlight weaves together a multi-generational tale of family secrets, the slipperiness of memory, and the aftermath of war.